VSF have kindly been given 2 Any Day tickets for this year's "Once Upon a Time" themed Southport Flower Show, so we thought we would auction them out to the highest bidder. Southport Flower Show is the largest independent flower show in the country, attracting over 50,000 visitors across 4 days. 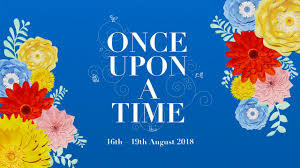 It is being held from 16th – 19th August 2018 and the theme this year is: Once Upon a Time. Alan Adams, Trustee Director at Southport Flower Show, has very kindly donated 2 Any Day Tickets to VSF for us to auction off to the highest bidder. Vital Signs Foundation (VSF) is a small charity which is making a massive difference in identifying previously undiagnosed heart defects, potentially saving lives in young people aged 16 – 35 from Sudden Cardiac Arrest. Did you know, 12 apparently fit and healthy young people aged 35 and under, collapse and die EVERY WEEK in the UK from undiagnosed heart conditions? A donation of £30 pays for one person to be screened – who knows, that donation could save somebody’s life! It could be a member of your family or one of your friends! Fancy spending a whole day marvelling at the splendour of everything that the show has to offer as well as helping our small charity make a difference? Just contact Tracey at info@vsf.org.uk with your bid – it’s a win win for everyone!